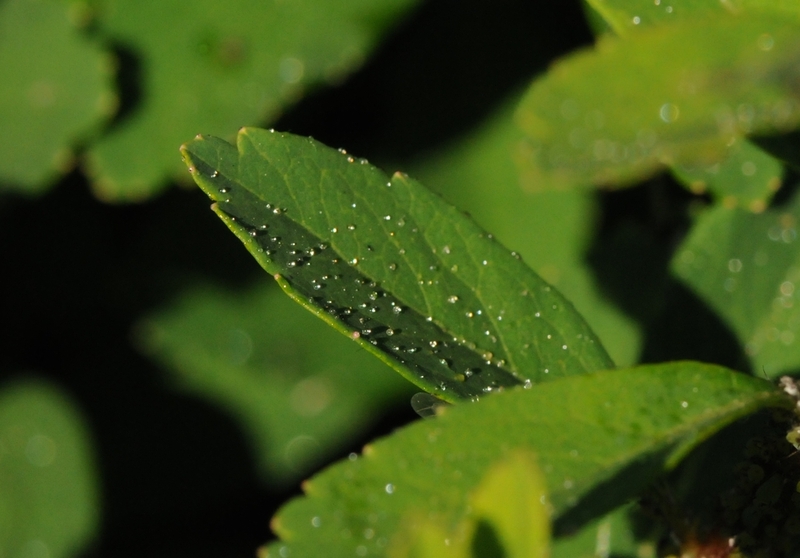 Tiny liquid jewels of honeydew adorn the leaves of aphid-infested plants. Last week we visited seed corn maggots, flies victimized by a nasty fungus omnipresent this soggy spring. While recent weather may have been the bane of seed corn maggots, wet weather and cool temperatures have been the boon for a large clan of sap-suckers called aphids. While exploring some of my favorite landscape beds, I discovered every sprig of the resident roses, spireas, and daisies festooned with aphids and dripping with droplets of the sweet sticky liquid called honeydew. A beneficial parasitic wasp stops by a leaf for a quick carbohydrate fix. Why are aphids so abundant at this time of year and where does this honeydew come from? As plants break bud in spring to begin a new season of growth, production of new leaves and blossoms results in a steady flow of water and minerals from the roots to the shoots and the transport of nutritious sap within plants through a specialized vascular tissue called phloem. Phloem is a favorite feeding station for many types of sap-sucking insects including aphids. Aphids of all description are having a heyday during these glorious days, but the aphid’s saga began many weeks ago when eggs deposited last autumn hatched into tiny nymphs. A nymph inserts its stout beak into the plant’s phloem. The beak encloses a tube connected to a miniature pump in the aphid’s head. The pump passes food along to the digestive system of the aphid where nutrients are extracted and used for growth and development. Phloem sap is relatively poor in nitrogen but high in carbohydrates. For aphids to obtain enough nitrogen for growth and development, large volumes of plant sap must be imbibed. Excess residue of this extraction process is excreted by the aphid as sweet sticky liquid called honeydew. 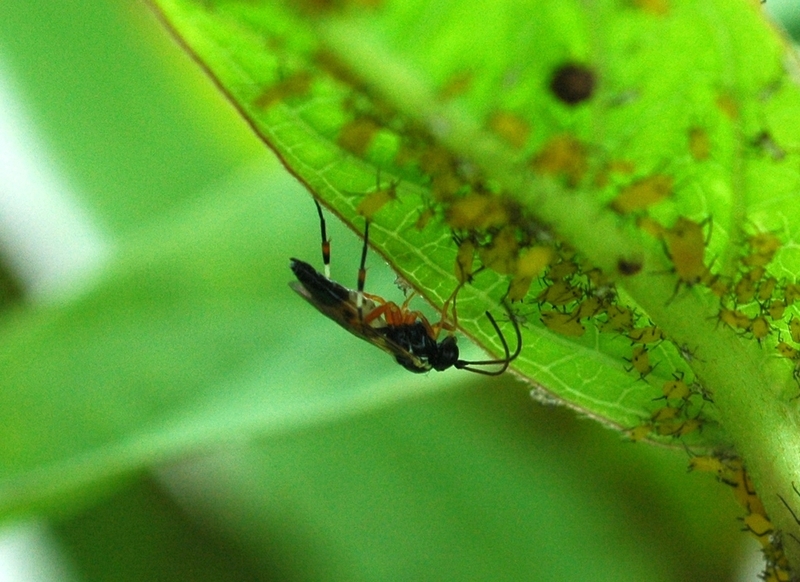 Both nymphs and adult aphids produce copious amounts of honeydew. Honeydew serves as the substrate for an ugly leaf-coating fungus called sooty mold. Aphids are not alone in their craving for sweets. Insects of all description need a source of energy to power their good and dastardly deeds and most of this energy comes from carbohydrates. For plant feeding insects, most carbohydrates come from leaves they eat or from rich stores of nectar found in flowers or specialized liquid-producing glands called extra-floral nectaries. However, my sojourn to the aphid patch revealed several visitors tanking up on aphid honeydew. Some of the most notorious guests of aphids are many species of ants that serve as their body guards. To learn more about the intimate relationships between aphids and ants, please visit the previous episode entitled “Aphids and their bodyguards.” I was delighted to see several species of insects such as gangly crane flies and parasitic wasps patrolling leaves and sipping sparkling droplets of honeydew. Crane flies look like mosquitoes on steroids, but adults are harmless to humans. To learn more about these delicate giants please visit the episode entitled “Jersey skeeters.” From the standpoint of humans, perhaps the most important benefit of honeydew is its role as a source of nutrients for many species of small wasps that attack and kill heinous pests such as destructive caterpillars, scale insects, and aphids themselves. While other sources of carbohydrates such as nectar from flowers are the primary source of carbohydrates for many beneficial insects, scientists agree that honeydew is an important food supplement for droves of good guys in your garden. Unfortunately, as honeydew drips onto leaves of plants, it serves as a substrate for a rather ugly fungus called sooty mold. 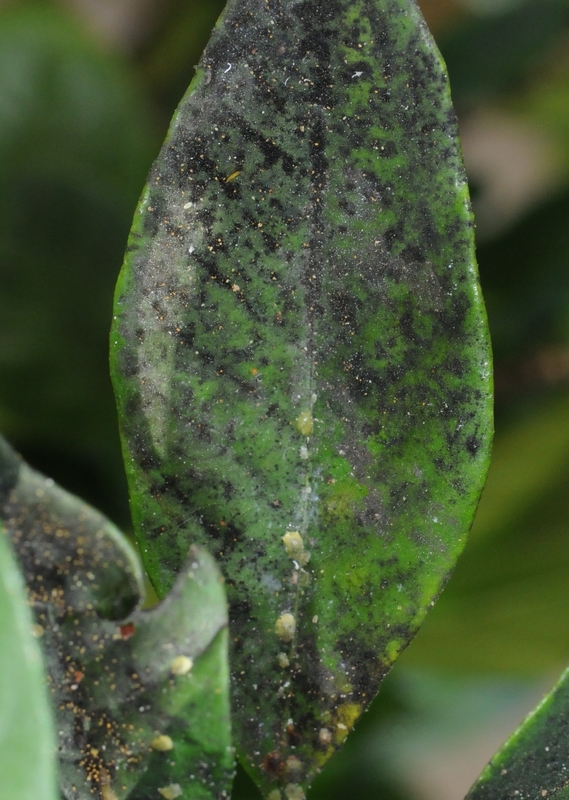 Sooty mold does not directly attack the leaf’s tissues, but its presence surely disfigures the appearance of delightful foliage in spring and summer. Ah, but in the end these honeydew producers will get their come-uppance for honeydew also serves as a signal to legions of predatory insects whose favorite foods include plump juicy aphids. We will visit some of these aphid eaters in an upcoming episode of Bug of the Week. The wonderful books “The Ants” by Bert Hölldobler and Edward Wilson and “Aphid Ecology” by A.F.G. Dixon, and the article “Honeydew as a food source for natural enemies: Making the best of a bad meal?” by Felix L. Wäckers, Paul C.J. van Rijn and George E. Heimpel were used as references for this Bug of the Week.